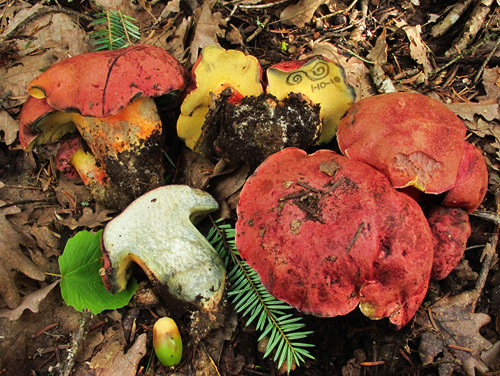 Fruitbodies often clustered. Pileus up to 15 cm, at first hemispherical, then convex, flat-convex to flat, dry, usually velvety, but sometimes smooth when old, pale red, red, dark dull red, reddish vinaceous, darkening when bruised, cap margin often wavy. Stipe stout, cylindrical, club-shaped or swollen, cream or pale yellow to yellow, often reddish spotted in the lower part, covered with orange red, red or vinaceous granules, blueing or blackening when bruised. Flesh pale lemon yellow in the stipe, cream in the cap, blueing when exposed to air. Tubes pale yellow to yellow with olivaceous tint, bluieng when injured. Pores concolorous with the tubes, blueing or blackening when bruised. Smell mostly not distinctive, a bit earthy. Taste slightly acid. 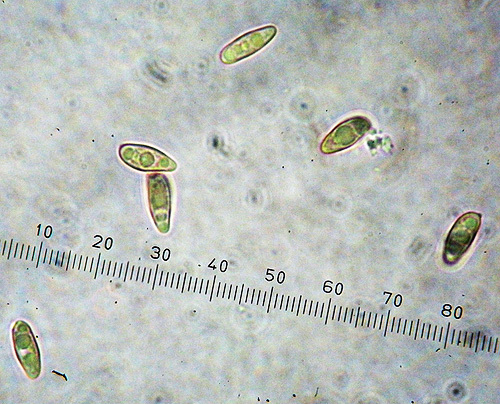 Spores 9.5–13 × 3–4.5 μm, ratio 2.7–3.6. Pileipellis (the cap cuticle) a trichodermium, composed of hyphae of cylindrical, finely encrusted cells. Habitat. Warm broadleaf forests, mycorrhizal with oaks (Quercus) or sweet chestnut (Castanea sativa). Distribution. Apparently southern, so far not seen outside of the Mediterranean area. Known from Greece, France, Italy, Spain and some Mediterranean islands – Corsica, Mallorca and Sardinia. Similarity. 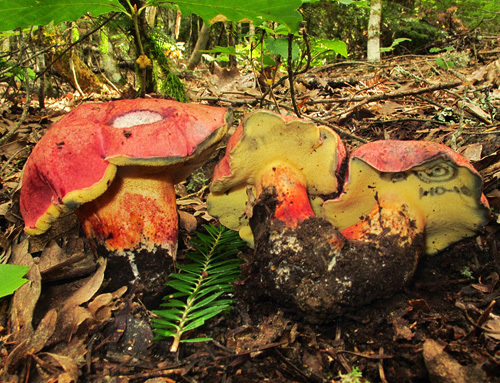 Similar to the poorly known Boletus adonis which has broadly ellipsoid spores. 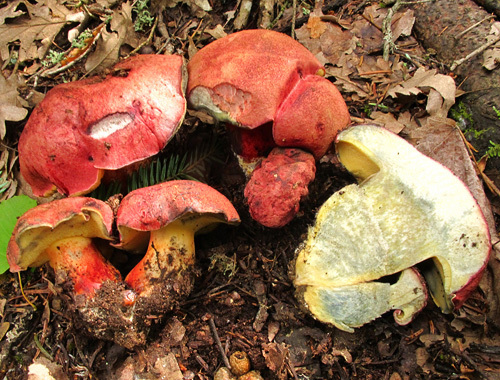 Compare also to Boletus fragrans. Notes. 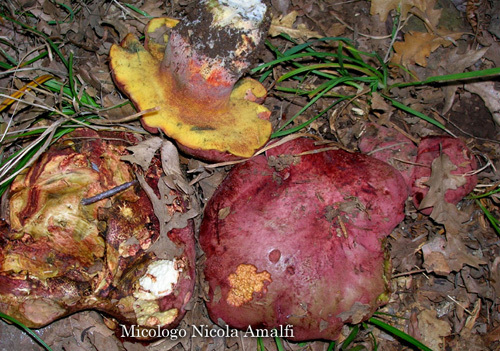 Some authorities use the name Boletus emilei Barbier. Bertèa, P. 1988. 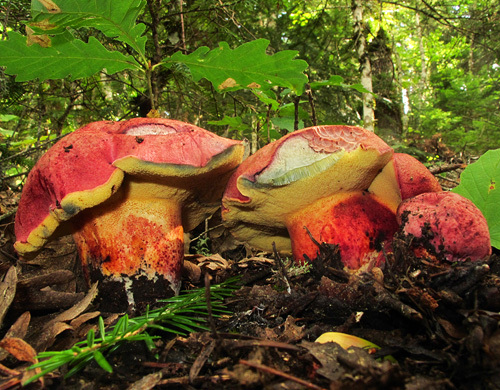 Boletus spretus sp. nov. – Documents Mycologique 18: 62.